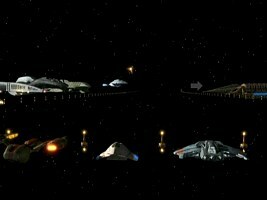 The "Antarian Transstellar Rally" in VOY: "Drive" is apparently named for the star Antares in the Alpha Quadrant, but actually takes place in the Delta Quadrant, with a species called the "Antarians" as hosts. Silly writers! Anyway, there are countless different designs both among the ships of the participants and of the spectators. All of them were CGI, and almost all of them are re-uses. 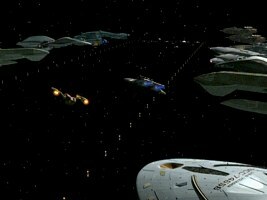 In this article we identify all vessels, using screen caps and other CGI images directly derived from the episode. We point out oddities in the sequence of events, we try to identify the involved races and we comment on the plausibility of the many vessel types that appear. When the race begins, all ships form a "U", with the participants lined up at the bottom, and the spectator ships on either side of the starting lanes. 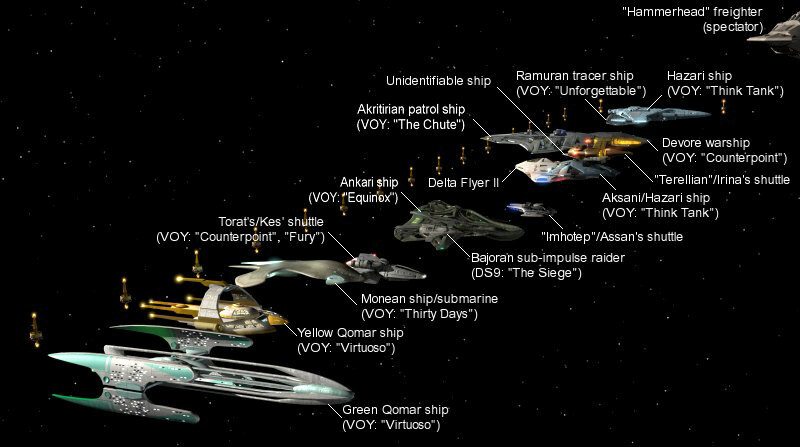 There are 11 spectator vessels of 8 different types, including Voyager. 6 of them are located on the on the left side and 5 are on the right side (in the direction of the start), and they don't change their positions at any time during the race. Regarding the racing shuttles, there are 15 participants altogether. At least, we can recognize 15 distinct designs in the start line-up. In the course of only 15 seconds just before the start some of these vessels switch their positions. This has to be an error in the CGI arrangement, and maybe a purposeful one in order to get good views from both sides of the starting line. Irina and Assan entering the "U"
In the first take Irina's "Terellian" ship and Assan's "Imhotep" ship pass by Voyager from the upper end of the "U" and assume their start positions in the background. We can't see much of the participants because they are too far away, but the spectator ships are almost all well recognizable here. As seen from the starting line, we can make out on the left side: Voyager, the presumed Antarian ship (ex-Karemma), Daelen's ship (VOY: "Vis à Vis"). The next one is the most interesting ship, a new design. We previously thought it was just a kitbash of the Vaadwaur ship from "Dragon's Teeth" and the fake "Delta Flyer" from "Live Fast and Prosper", but the forked front tip doesn't look like on the Vaadwaur vessel. The boxy aft end aft is better recognizable on a depiction in the Fact Files. This part isn't quite like on the "Delta Flyer". The new design will later appear as Vojean/Wyngari ship in "Q2". 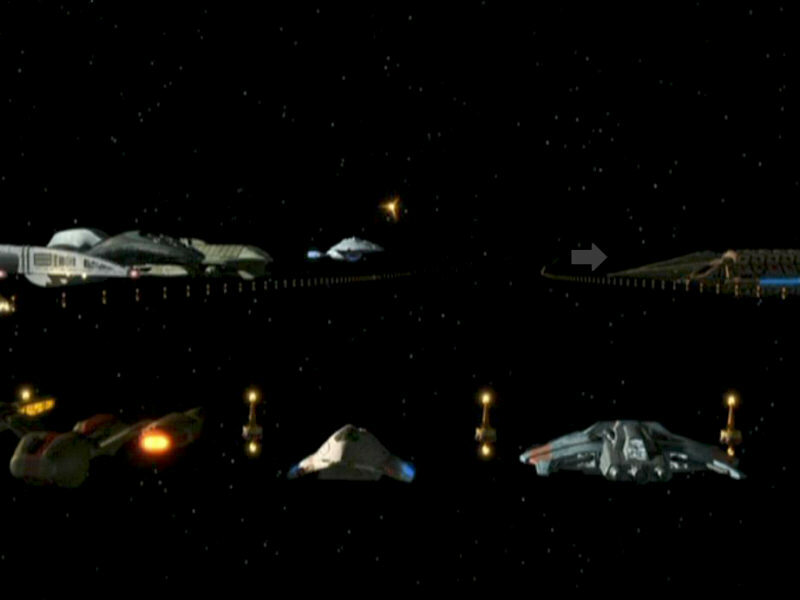 The new ship is followed by two "hammerhead" freighters (ex-Bajoran). 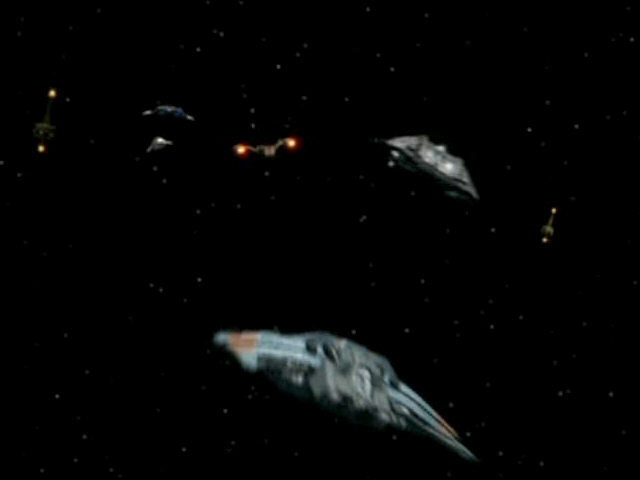 On the other side (right side as seen from the starting line) there are four more ships: a Mawasi cruiser (VOY: "Year of Hell"), another ship like Daelen's, another Antarian ship and Qatai's ship (VOY: "Bliss"). 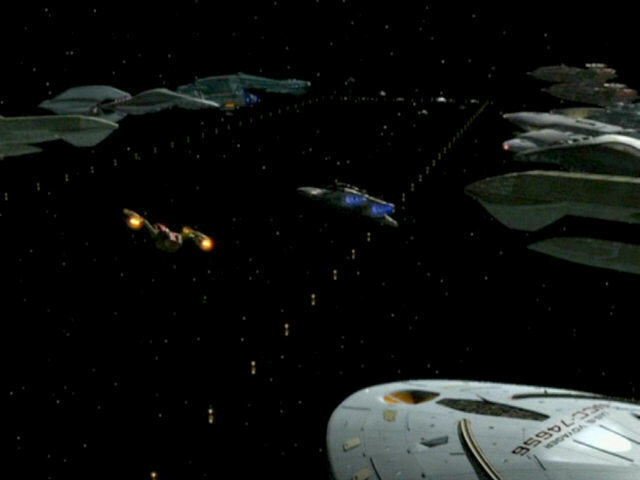 In the next shot we can see all participants lined up at the start, looking from the lower left end of the "U" (possibly from one of the "hammerhead" freighters). The Fact Files and, even better, an image on Lee Stringer's website, depict the starting line from much the same perspective and allow a better identification. In the far background we can see the blue engine of the Mawasi ship. The first participant vessel is the green Qomar ship (VOY: "Virtuoso"). There are 14 buoys visible altogether, delimiting 13 lanes. The rearmost buoys is permanently illuminated, all other ones are flashing. The first lane in front of the Mawasi ship is obviously not occupied, the green Qomar ship is in the second lane. The ship in lane 3 is not recognizable here. In lane 4 we can see the Monean ship (VOY: "Thirty Days"). Kes's shuttle is in lane 5. In lane 6 we can recognize Assan's ship, followed by the big Ankari vessel (VOY: "Equinox") in lane 7. 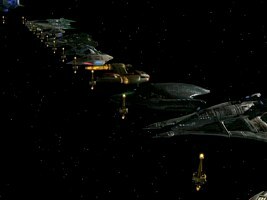 The next lane 8 is occupied by the small Bajoran raider (DS9: "The Siege"), which is barely recognizable in front of the much bigger Ankari vessel. The Aksani vessel, which will be identified as such in the course of the race, is in lane 9. It is a re-use of the Hazari shuttle (VOY: "Think Tank"). The Delta Flyer is in lane 10, followed by Irina's ship in lane 11. 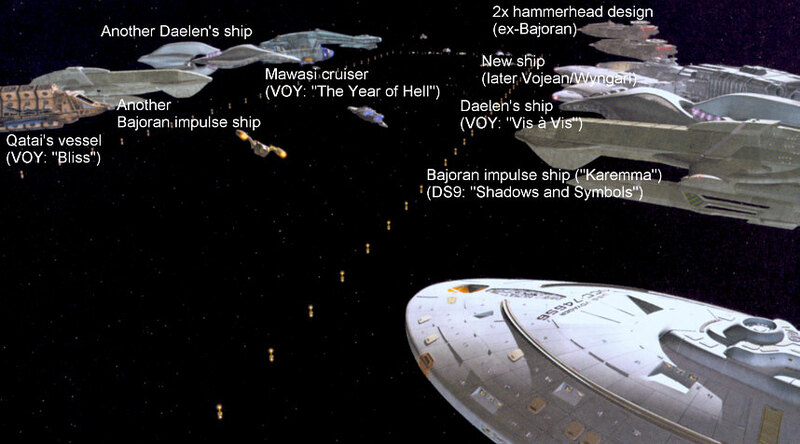 In lane 12 we can see the Devore ship (VOY: "Counterpoint"), flying backward here. The foremost racing vessel in lane 13 is the Akritirian patrol vessel (VOY: "The Chute"). We can see a small part of a ship in the 14th lane, but only on the screen cap. The hull portion is rounded and its color is yellow. We surmise it is a second Qomar ship, one that will be clearly identifiable later. Two more ships, which must be behind the camera, are not visible at all from this angle. 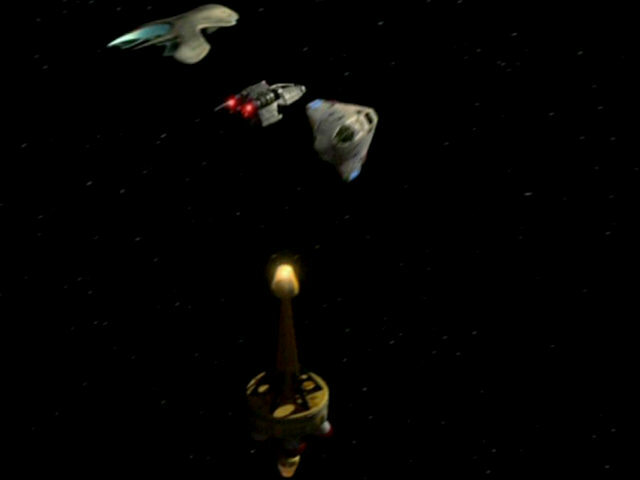 The next brief take shows a part of the ships from behind, and we can see how Voyager launches a photon torpedo as the starting signal. We can have a good look at the spectators again, especially at the forked front tip of the later Vojean/Wyngari vessel on the left side. The so far unseen Reptohumanoid vessel (VOY: "Parturition") is visible on the right, behind Qatai's vessel (which is truly huge here). When the racing vessels rush forward, we can see them from the lower right side of the "U". Once again the Fact Files and Lee Stringer provide better images than the screen caps. We can now see 15 participants, and identify 14 of them. Surprisingly, a few of them have switched positions in only 15 seconds just prior to the start. On the lower left end of the "U", in lane 2, there is still the green Qomar vessel. The ship in lane 3 was previously not recognizable, now we can see the yellow Qomar ship in this place, which we previously spotted in lane 14. So far it could be a second ship of the same type, but some other vessels have moved too. The Bajoran raider and Assan's ship have switched places. They are now on the opposite sides of the big Ankari ship compared to their previous positions. In lane 12 we could previously see the Devore ship. Now a new one is in this place, but it is not (yet) identifiable. The Akritirian ship is still in lane 13, and the Devore vessel can now be found in lane 14. 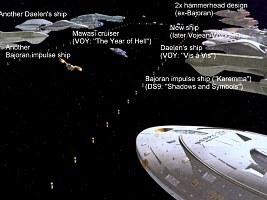 Two new ships follow, the Hazari vessel (VOY: "Think Tank") in lane 15 and the Ramuran tracer ship (VOY: "Unforgettable") in lane 16. So there are 15 racing vessels in total (lanes 2-16), some have quickly changed their positions and one remains unidentified. 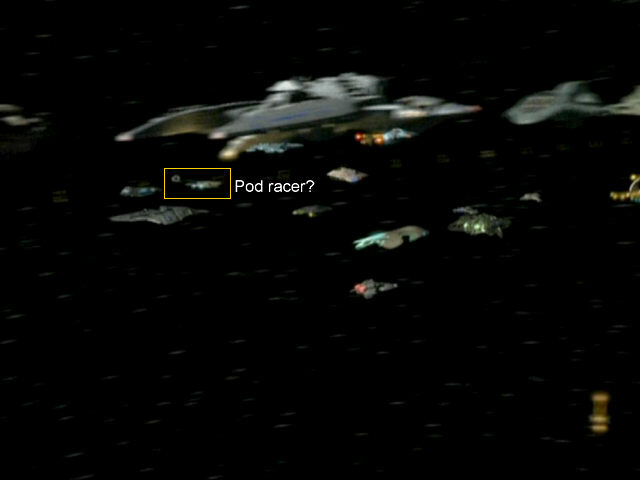 We can see that the unidentified vessel has two bright blue engines, but it also seems to drag along some sort of pod, almost like a "pod racer". Later in the rally we will see that there is suddenly a Benthan coaxial warp prototype (VOY: "Vis à Vis"), which was not visible in any shot of the start lane, and which can't have been among the starting vessels, unless it was always obstructed by a bigger vessel. Anyway, the coaxial warp ship does have two blue engines, but doesn't sport such a pod. It remains a mystery where the pod comes from. Maybe a rendering error? In the following shot we can see the vessels quickly pass by Voyager, filmed from the opposite (right) side of the "U", all with massive motion blur. 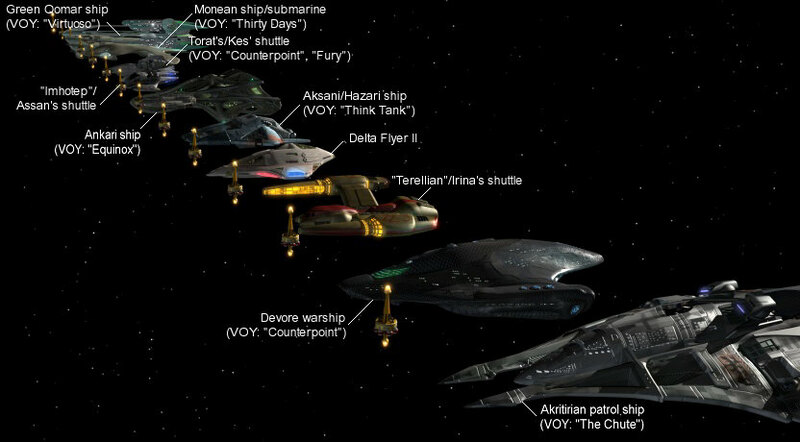 The first is Assan, followed by the Hazari, the unknown ship, the Delta Flyer, the Ankari ship, probably the Bajoran sub-impulse raider, the Ramuran tracer ship, the green Qomar ship, the Monean ship, the Devore ship and the yellow Qomar ship. In the following close view of Voyager we can't identify any more of the remaining vessels. Some of the vessels will not show up again for the whole rest of the race. The following scenes all focus on the Delta Flyer and the surrounding racing shuttles. 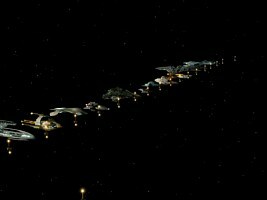 When the Delta Flyer overtakes the Monean ship and Kes's shuttle during a "tack maneuver", Seven states: "We've passed two more ships. Three still ahead of us." Briefly later Assan passes by the Delta Flyer, so he would be in the fourth position now. Still later Seven reports: "The Delta Flyer is in fourth position, having completed 62% of the course. The Aksani vessel is in third position, having completed 68% of the course." So Flyer must have overtaken another vessel by now. The Flyer later overtakes the Aksani ship (verbally identified by Tom), and he says: "Now it's just down to Irina and Assan." So the Flyer is in the third position now. 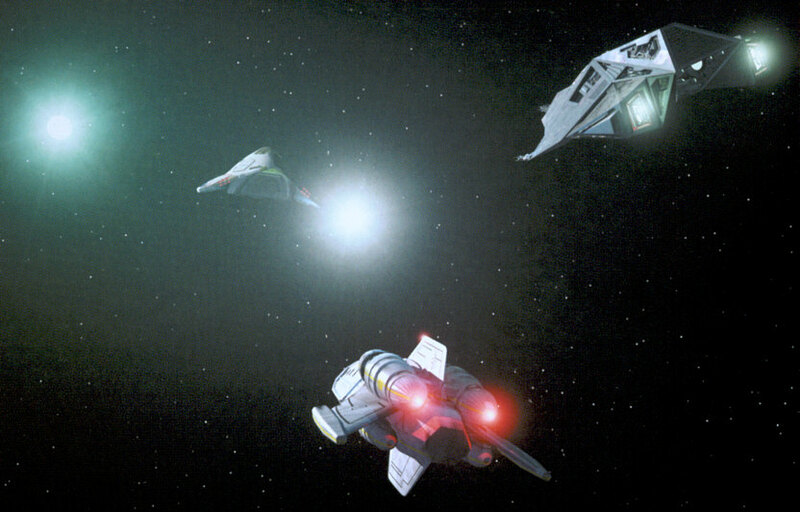 In the Moebius inversion (another awkward Alpha Quadrant reference, as if the local aliens would know the human mathematician Möbius), finally, the Flyer passes by these two ships and is in the lead now. The race is interrupted as Irina's copilot is injured. After the race has been resumed, Irina's ship can be seen right behind the Delta Flyer, followed by Assan's ship, the Ramuran vessel and the Aksani (Wysanti) ship. The already mentioned Benthan ship suddenly shows up when the Delta Flyer is approaching two pulsars. It is barely recognizable on screen caps, but the according image from the Fact Files shows the Benthan coaxial warp prototype very clearly. The other ship following the Delta Flyer is Kes's shuttle. Irina and Assan must have fallen behind at this time. The two other ships are still on the Delta Flyer's heel when the vessels turn around a buoy some time later. At this point Irina has already fallen behind on purpose, and Harry, who is now flying with her, notices that something is wrong. Assan wins the race - backward! 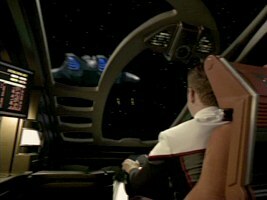 As Tom stops the Delta Flyer to talk to B'Elanna, we can see Assan pass by. For some reason he has managed to catch up with at least two vessels in front of him, and he now takes the lead. Finally, when Assan passes the finish line as the winner of the rally, we can see something strange: He is flying backwards! The orientation of his ship is wrong as seen from outside, as well as seen from Voyager's mess hall. Well, perhaps he was so far ahead that he could afford the joke of turning around his ship and just letting inertia do its job? Only few species taking part in the race were given names, and three of them are so incredibly brainless choices that the author deserves a slap into the face. Aside from the "Antarians" there are "Terellians", as if this name hadn't already been excessively over- and abused in the Alpha Quadrant with half a dozen different aliens named exactly like this. The third failing is the species named "Imhotep" like an ancient Egyptian god. Two other mentioned races are the Aksani and the Chessu. As already mentioned, the information which of the above designs belongs to which species is largely missing. But thanks to some explicit statements and especially to Neelix's live report there are a few exceptions. Since O'Zaal, the Antarian who coordinates the rally, arrives on the Karemma/Bajoran vessel, it is safe to say that this visitor ship is supposed to be an Antarian design. Seven's information about the race: "The Delta Flyer is in fourth position, having completed 62% of the course. The Aksani vessel is in third position, having completed 68% of the course." Neelix, trying to make it sound more exciting: "With only 58 million kilometers left in the first segment the Aksani, Imhotep and Terellian ships are still battling for the lead!" - A few moments later we see the Delta Flyer pass by the ship of Wysanti design, so this must be the Aksani ship. Neelix: "The Terellian and Imhotep ships are still in the lead. The Delta Flyer trailing by a few seconds." - What we see is that the Delta Flyer is catching up with Irina's and with Assan's vessel. Which of the two is "Terellian" and which is "Imhotep" does not become evident yet. 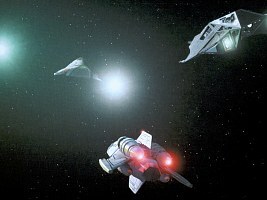 Neelix: "After fighting off a formidable challenge from the Terellian team, the Delta Flyer has managed to hold onto its lead going into the third and final segment." - At this time we can see Irina's ship just behind the Flyer, so she is the Terellian. Neelix: "Meanwhile, the two Chessu ships are continuing to advance, claiming fourth and fifth position!" - While there is nothing corresponding on screen, it is easy to notice that only two of the designs in the race are alike - the two Qomar designs. It is a good guess that these two are the Chessu ships, although we must doubt that the author's screenplay was so detailed that the VFX department intentionally included two similar ships. All the participating vessels of the rally were clearly scaled to be very small, at most 50m long. This becomes obvious in all shots in which they are lined up relative to each other, and especially relative to the large vessels on either side of the start line. But many of these shuttle-sized vessels are actually scaled down models of big starships. Not even the window lighting was changed, although this would have helped to insinuate a smaller size. Also, many if not most vessels are re-uses that don't even belong into this particular region of space. 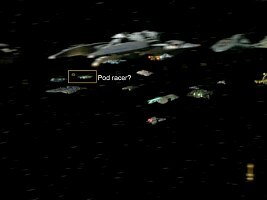 Ramuran tracer ship VOY: "Unforgettable" It is clear that the Ramurans would never take part in this race, even if their homeworld were close enough. See also Redresses of the Ramuran Tracer Ship. Hazari ship VOY: "Think Tank" We don't really know the intended size of the original Hazari ship, but it seemed to be considerably larger than a shuttle. It is also questionable how and why the Hazari should have made all the way to the race. 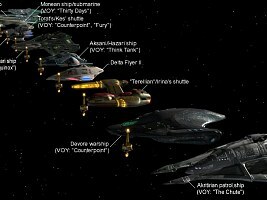 Devore warship VOY: "Counterpoint" This is the most blatant scaling, knowing that the Devore ship was previously much larger than Voyager. The ship is flying backward here. Akritirian patrol ship VOY: "The Chute" The ship is clearly much too small here. 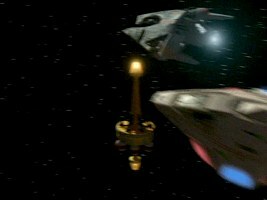 Although the Akritirian ship was re-used for the Ba'neth vessel in VOY: "Riddles" and will later appear as Lokirrim patrol ship in VOY: "Body and Soul", which would make it indigenous to this region of space, the racing shuttle must be a completely different, much smaller design. See also Redresses of the Akritirian Patrol Ship. coaxial drive prototype VOY: "Vis à Vis" This one appears out of nowhere in the middle of the race. It has to be the previously unidentified vessel, although it is lacking the "pod" that is visible in one scene. 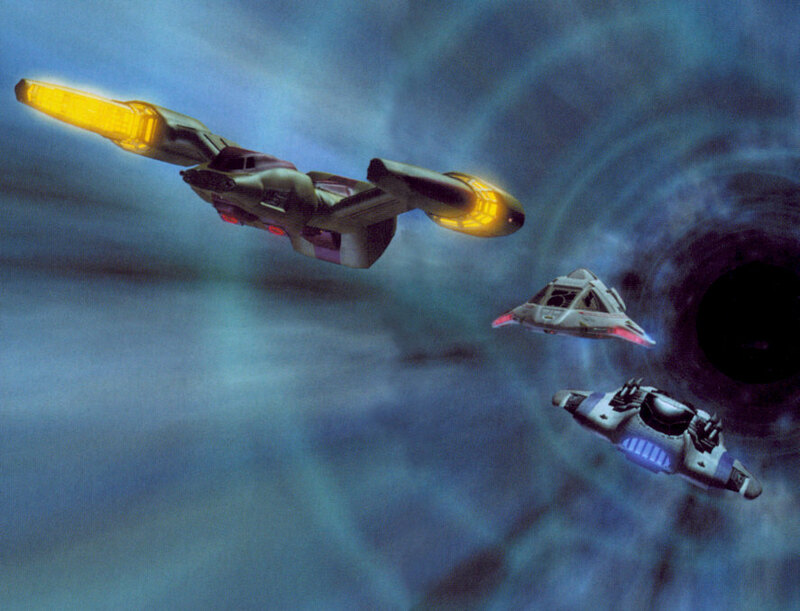 The Benthans clearly wouldn't take part in this race, even though the coaxial warp prototype may be considered very fast. "Terellian" racing shuttle - Irina's shuttle. This is an essentially new design, but we surmise it was based on an earlier enemy ship that was briefly seen attacking in VOY: "Latent Image". VOY: "Think Tank" The design also appeared as the Wysanti ship in VOY: "Imperfection". Unlike the bigger Hazari ship above, their shuttle might be a better candidate to take part in the race. Regarding the Wysanti ship, we know that this design (which they might share with the Aksani) is small compared to Voyager, but we would still expect it to be considerably larger than the Delta Flyer, so it would be out of scale. "Imhotep" racing shuttle - Assan's shuttle. This is a modification of the Cardassian workbee from DS9: "Tacking into the Wind". 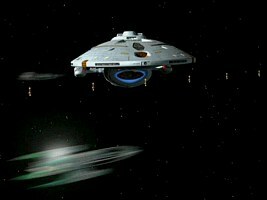 Ankari ship VOY: "Equinox" We know from "Equinox" that the Ankari may cross vast distances with their warp drive (which remains unexplained in the episode). Still, it is doubtful whether they would take part in this race of local importance. Bajoran sub-impulse raider DS9: "Shadows and Symbols" This CGI version of the Bajoran fighter (which first appeared as a miniature and mock-up in DS9: "The Siege") is barely visible beside the bigger Ankari vessel. Kes's shuttle VOY: "Fury" Kes flew this type of shuttle in "Fury". The racing shuttle could be well the same design as in its previous incarnation. See also Redresses of Tau's Pirate Fighter. Monean ship/submarine VOY: "Thirty Days" We certainly wouldn't expect to encounter the Moneans so far away from their isolated water planet. Also, their vessels were clearly larger than they appear here. Yellow Qomar ship VOY: "Virtuoso" The original sizes of the Qomar designs are unknown, but their structure suggests that they have to be much longer than 50m, because otherwise there would be hardly any useful volume (even if we take into account that the average Qomar is only 1,50m tall). 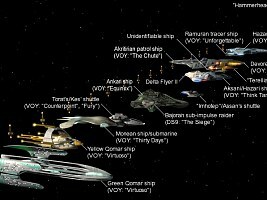 One of the spectator ships is a new design, the rest are re-uses, some of ships that don't belong into this particular region of the Delta Quadrant. All these ships are about the same order of size as Voyager. At least Qatai's small, previously just runabout-sized vessel, has been scaled up a great deal. DS9: "Shadows and Symbols" CGI modification of the Karemma ship from DS9: "Starship Down", seen as Bajoran ship in DS9: "Shadows and Symbols". We clearly wouldn't expect this characteristic design in the Delta Quadrant. At least, it seems to have a different, less colorful and maybe less detailed surface texture here. One of these ships transferred the race coordinator to Voyager, so it may be assumed that this is an Antarian design. See also Redresses of the Karemma Ship. Daelen's ship VOY: "Vis à Vis" This vessel would be far away from its homeworld. At least, the size seems to be about correct in this case. Unknown new design - This ship may incorporate parts of the Vaadwaur ship and the Impostors' "Delta Flyer" but is essentially a new design. It will reappear as Vojean/Wyngari vessel in VOY: "Q2". DS9: "Shadows and Symbols" This ship showed up extremely often through the years and four series, since DS9: "Shadows and Symbols" as CGI. 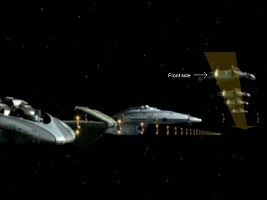 The next appearance after VOY: "Drive" will be as the Nuu'Bari freighter in VOY: "Flesh and Blood". The two latter designs may easily be the same, while it should be unrelated to any of the other incarnations of the model. See also Redresses of the Husnock Ship. Mawasi cruiser VOY: "Year of Hell" This vessel would be far away from its homeworld. At least, the size seems to be about correct in this case. Daelen's ship VOY: "Vis à Vis" Second ship of this type in the episode. DS9: "Shadows and Symbols" Second ship of this type in the episode. Qatai's vessel VOY: "Bliss" Also used as the looter's vessel in VOY: "Imperfection". This vessel is clearly much too large here. It should have better been among the racing shuttles, but obviously it didn't look streamlined enough for that. See also Redresses of Qatai's Vessel. Reptohumanoid ship VOY: "Parturition" The model is visible only in the far background at the Antarian Rally in "Drive", on the right behind "Qatai's vessel". The pointed front tip is the former aft end of the Reptohumanoid ship. Since the design will appear as a Nygean vessel later in the seventh season, we propose that the vessel at the race is a Nygean ship as well. See also Redresses of the Reptohumanoid Ship. Thanks to Alexander Hartmann, Gary, Dr. Phlox for pointing us to missing ships.